"I know of no more encouraging fact than the unquestionable ability of man to raise himself through conscious endeavor." where readers run and runners read! Welcome! 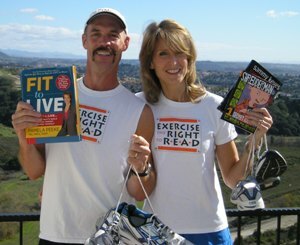 We are Wendelin Van Draanen and Mark Parsons, the husband/ wife team coordinating the Exercise the Right to Read campaign. Wendelin is a popular children’s book author and a former classroom teacher. Mark is also a writer (non-fiction) as well as an instructor. We are the parents of two school-aged children. The program is free and easy to implement, with prizes awarded each May. Information and materials are available at The School Program link of this site. Our goal is to help school libraries offset growing budget cuts, help improve childhood fitness, and put a spotlight on the good work that First Book does. Won’t you get involved? Click on any of the buttons in the orange column to the right to find out more. Together, let’s Exercise the Right to Read!